An imaginative gallery owner in Portimão has initiated a project highlighting the sardine and the enormous part this small tasty fish has played in the history and economy of this important town in the Algarve. 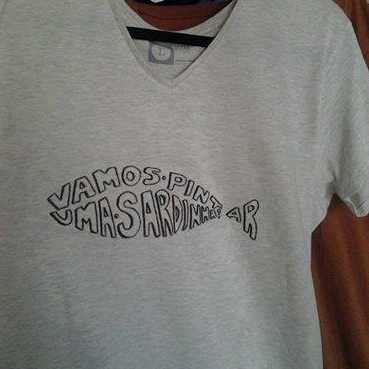 This long term project is already well on the way and António Serra is recruiting artists and others to ‘Paint a Sardine’. He is keen to involve people from the Algarve and others connected with the Algarve in some way. I regularly visit family residing near Portimão and I was invited to an exhibition of the first 100 or so paintings António has collected. The artists show great creativity and the treatment of the subject varies enormously; some humerous, others somewhat political, some very clever and some simply depicting the sardine. I was delighted to be invited to participate. 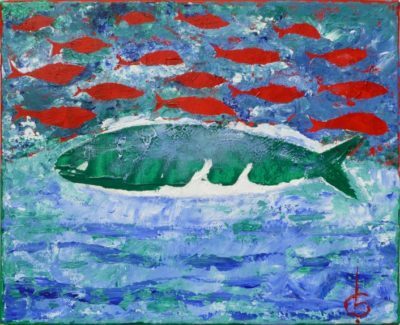 I paid a small fee and was given a canvas, the only directive being that my painting should be of or about ‘sardinhas’. This is the result – The red and green of Portugal dominates my painting. 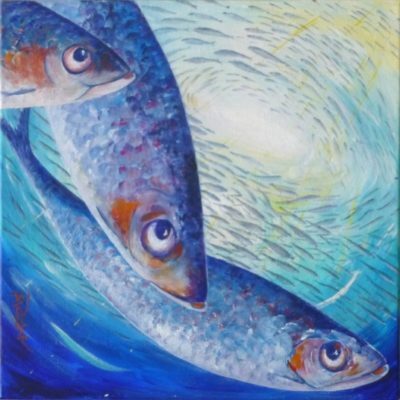 You can read about the creation of my sardine painting in the previous post. My sister’s painting is among the early contributions. I Love it! photo: Sardinhas by bj Boulter. Sardines are caught all around the Portuguese Coastline, but the Algarve provides the most sought-after sardines and Portimão has long been known as the sardine capital. The fish-canning industry was a major employer in the area for many years. The many factories that used to thrive here have fallen into ruin or been converted for other uses. The former ‘Feu Hermanos’ canning factory dates from the end of the 19th century, and has been sympathetically restored and remodelled and is now a museum showing the former way of life. A festival celebrating the esteemed sardine is held every year during the month of August. Sardines are good for the heart – not only because of those romantic moonlit evenings at the waters edge! The plentiful Omega 3 and vitamin B12 makes the sardine a healthy food for our hearts and these oil-rich fish are good for bones and our health in general. The sardine industry is beautiful in many ways. Until about 40 years ago Portimão harbour was home to a large fleet of fishing boats and there were several boat-building and repair yards. The colour and activities have been captured by many artists and photographers over the years. 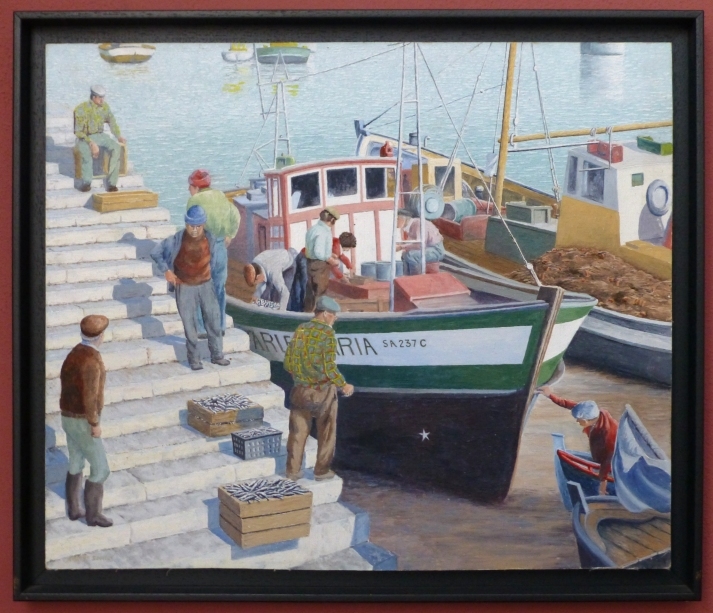 The fishermen, fishing boats and port were favorite subjects of my father’s paintings. photo: a painting of Portimão harbour by Royston Boulter. António Amado Serra concieved the idea for this project. He is the owner of Galeria XXI, in Portimão. The gallery shows a wide variety of paintings and prints by local artists including sculpture and jewelry. As well as providing a framing service he sells art materials and energetically encourages art in the local population by hosting art projects for adults and children. If you would like to participate in this Algarvian project you can contact António through his Facebook Page where you can see more of the collection so far and share to spread the word. If you like this, or love sardines or the culture surrounding them, please comment below and share.